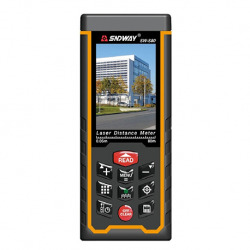 SNDWAY SW-S80 is precision, efficient and innovative laser distance meter, equipped with electronic level bubble and camera. Distance meter working distance up to 120 m. 2 years warranty, 1 year replacement guarantee. SNDWAY SW-S80 is precision, efficient and innovative laser distance meter, equipped with electronic level bubble and camera. Distance meter working distance up to 80 m. 2 years warranty, 1 year replacement guarantee. 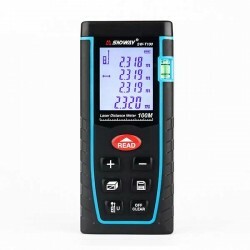 SNDWay SW-T Series is a compact and easy-to-use laser distance meter with a number of functions, like area, volume, addition/subtraction etc., and memory for 30 measurements. Available models for 40m, 60m, 80m and 100m measurements.